Readers who have kept wide-awake though my many posts cannot have failed to register a certain coolness towards the London Photographers’ Gallery, though this hasn’t prevented me from being a member since almost its earliest days (though I think my membership has lapsed a couple of times over the years thanks to their administrative incompetence.) The gallery may not be much, but it is more or less all we have, and I live in hope, though not much, that one day it will start caring about photography rather than seeing its role to try to ingratiate itself to an art establishment that really doesn’t want to know. But that isn’t really what I sat down to write about today. You can read my other posts, for example Paris and London: MEP & PG and Zombies in Ramillies Street to get some idea of my thinking about the Photographers’ Gallery. Often on my visits to the gallery, the most interesting work is to be found in the bookshop and the print room, and rather than pay your £4 to confirm your feeling that their might be a very good reason why William Burroughs’ photographic work is so little known, that David Lynch is a considerably better “film director, television director, visual artist, musician and occasional actor” (thanks to Google) than a photographer, and that Andy Warhol was better at almost everything else than taking photographs, I’d suggest you go downstairs to the book shop and print room. 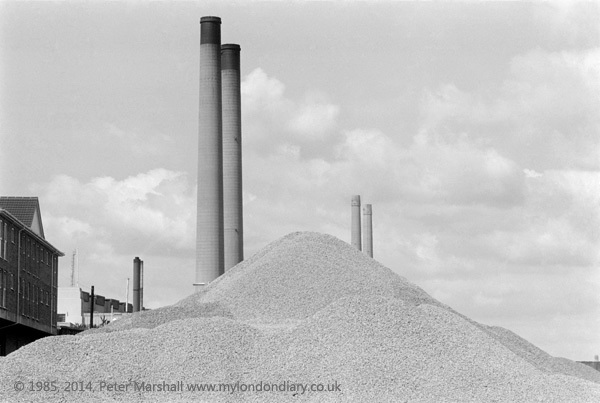 Because there you will find some interesting photography, Giacomo Brunelli’s Eternal London, a show which continues until 27 April 2014. There are around 30 pictures from the series on Brunelli’s web site, along with his other series, The Animals and Animals II, and Self Portraits. I wrote about his ‘Animals‘ in 2007, and mentioned them again enthusiastically when they were on show at Photofusion in 2011. I still find them exciting. Self Portraits is a series prompted by Lee Friedlander’s famed 1966 image of the photographer’s shadow on the back of a person on a New York street (you can see more of Friedlanders work on ASX here) but Brunelli works through a whole series of changes, some quite amazing in their effect. Eternal London certainly has its moments, and comes from two years of early morning walks around central London with the old Miranda camera given him by his father with its 50 mm lens, on a commission from the Photographers Gallery. Perhaps there were just a few I felt were too mannered, but overall I think it’s a fine set of work. My favourite image is a woman walking in the rain holding up her umbrella as she approaches Lambeth bridge. As the gallery text says, the mood is very ‘noir’, stills from some mysterious film of suspense. That I also thought of Robert Frank’s pictures from London in 1952-3 has more to do with hats than anything else. By the time I first saw those images around 20 years later thanks to Creative Camera, the hat had largely disappeared from the streets of London. The presence of them in a large proportion of Brunelli’s images is part of what gives his images a period feel, harking back to the black and white films of a previous era. Frank of course found fog as well, that kind of London peculiar that could be cut with a knife, or rather as the term pea-souper implied, scooped up with a spoon. The near-sihouetted man in a bowler with his umbrella and newspaper behind his back (the third image down on Chasing Light) and shining black shoes seen in rear-view on a mildy foggy street with a Routemaster in the distance is perhaps an archetype of Brunelli’s Eternal London. Though perhaps hard to imagine how the photographer managed to track down so many in streets where the only headgear on normal view apart from policemen’s helmets (perhaps strangely absent) are close-fitting woolly hats. 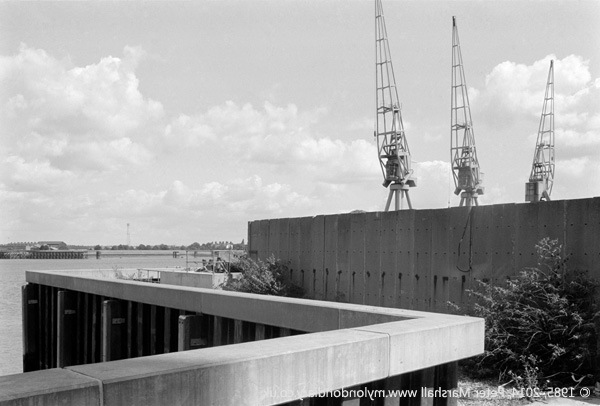 The book Eternal London, Giacomo Brunelli, published by Dewi Lewis to accompany the show (ISBN 978-1-907893-52-0) is a fine volume, and I think the printing suits the images even better than the handprinted silver gelatin prints available in the Print Room. The images on show (and for sale) are editioned in two sizes, 9.5×12″ and 20×24″ and I think work better on the smaller size. Though around half of the images in the book are printed with a plain verso and would be eminently suitable for framing! The title ‘Eternal London‘ comes from the Irish poet, author, singer, songwriter, and entertainer Thomas Moore (1779 – 1852) who wrote among many other works the words for the Minstrel Boy, The Last Rose of Summer, The Harp That Once Through Tara’s Halls, Believe Me, if All Those Endearing Young Charms, The Meeting of the Waters and many more. Byron on his deathbed made him his literary executor, trusting him with his memoirs – which he burnt at Byron’s family’s pleading. He published a ridiculous number of works, and though born in Ireland and writing and performing many Irish songs spent much of his life in London where he had come to study law at the age of 20. This is a small extract from his ‘Rhymes on the Road‘ published in a book dedicated to Byron in 1823, and written after Moore had had to leave England and travel on the continent to get away from the country until he could pay back a debt of £6000 following the loss of a court case (the money had been embezzled by one of his servants.) It’s not as often seems to be assumed a statement of some nostalgic longing to be back there, but actually a curse, a complaint about how, wherever you went to get away from it, even climbing up mountains in foreign lands, you heard people talking about what was happening in the City! Eternal London haunts us still. With every rill from Helicon ! Even before everyone was connected to the Internet and carrying a smartphone you couldn’t get away from it! It probably isn’t a surprise that Wikipedia has a page on Clothes hangers. On it I learn that the the shoulder-shaped wire hanger was invented around 1870 in the USA, though it cites three different claims for its genesis. 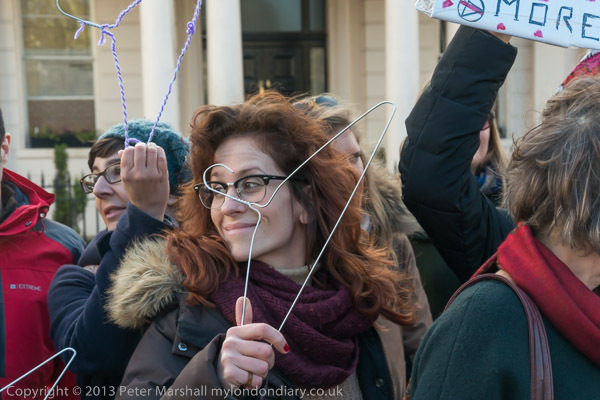 You can also find there about its role in the 1981 film Mommie Dearest, in which Faye Dunaway as Joan Crawford screams the line “No wire hangers, ever!” and its other film roles, as well as the many uses to which these simple twisted wire hangers have been put. One of which is of course back street abortions. And Dunaway’s line (which according to Wikipedia “quickly worked its way into pop culture” but never before made my acquaintance) would have been a very appropriate slogan for the protest at the Spanish Embassy against the proposed new laws in Spain to get rid of the laws which for the past 30 years have allowed abortions under similar restrictions to those in the UK and deny the right of women to access safe and legal abortion. 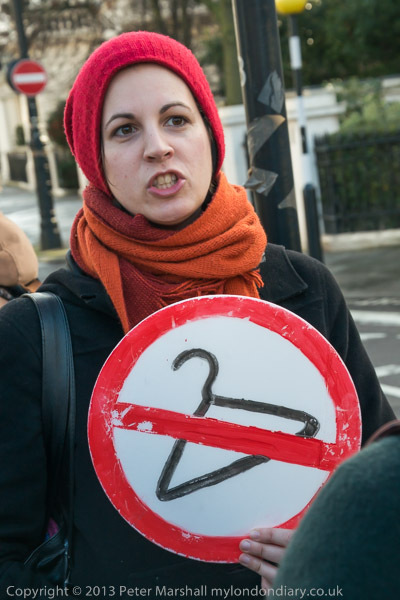 Spanish women and their British supporters were protesting with the slogan ‘My Belly is Mine‘ and were using decorated coat hangers as a symbol of their protest, so naturally these ‘belly-hangers‘ were going to play a central role in my images from the event, though there were some at the protest that would probably have been little use to the back street illegal operator. 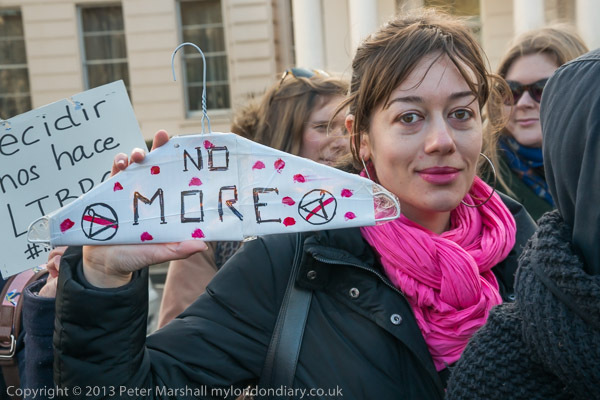 The belly-hangers were collected in and taken in a box across the road, together with messages from the women, to the embassy. There was a conversation on the entry-phone and the women were told to wait. Then another conversation and they were told to leave the box on the step, and they did so, taking a few belly-hangers to hang on the fence outside. 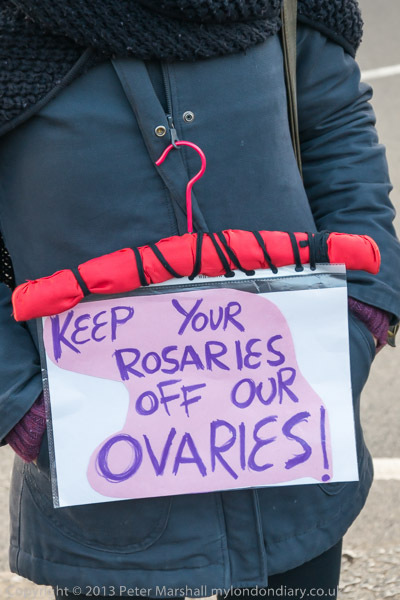 Five minutes later a police officer came back to the women bearing the box of belly-hangers, but nobody would take them back. I expect they just went into the police station dustbin, but it would be nice to think that somewhere inside the police station an officer was hanging up his jacket on top of the decorated message ‘No More‘. I was interested to read a post on Facebook by Pete James, Curator of Photographic Collections at the Library of Birmingham (UK) about a new biography of Mike Disfarmer, self-published on Amazon as an e-book by Kim O. Davis last week. You can read a little of the book ‘Disfarmer: Man Behind the Camera’ free on line and of course purchase the whole. The result of two years of research, the book would appear to tell us all that will ever be known about the photographer, who died in 1959, now 55 years ago. From the index on-line we can see that most of the details that might be of interest about his photography are still simply suppositions, though it would appear that Davis has a great deal of new material on his background and early life. There appears to be little if any new information not already available in the sample material,and at least one error leapt out at me, when Davis writes that before the early 2000s it had been “erroneously believed that no actual Disfarmer prints had survived.” Of course, as Julia Scully, whose 1976 book with Peter Miller (and show at the ICP) brought his work to the notice of the wider photographic world, had written: “Many of these originals are still to be found in the photo albums of Heber Springs families“. But it was only when New York photo collector Michael Mattis set in motion an organised search to buy up these images around Heber Springs in 2004 that around 3000 vintage prints were acquired from these families. You can see much of Disfarmer’s work and also read about him in the Disfarmer Project web site, which also has a short biography by Richard B. Woodward from the 2005 book Disfarmer: The Vintage Prints. Although Disfarmer’s life is intriguing, I wonder if knowing more about it really tells us more about his life’s work. Perhaps it is more worthwhile to examine his photographs rather than his peculiarity and peccadilloes. 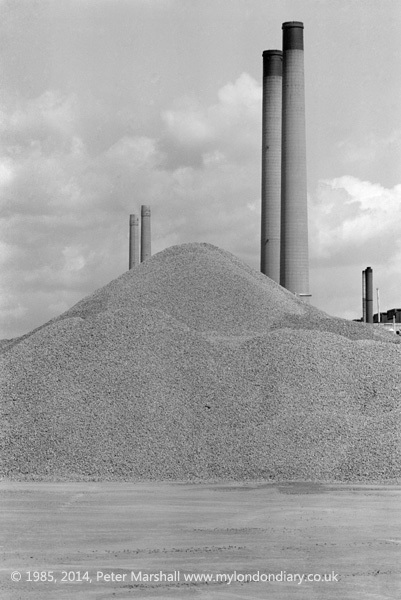 Roughly nine months before Mattis set up that project, I’d tidied up my notes about Disfarmer from an earlier talk, and added a few comments to them and published them on line as one of my regular weekly series of features on photography and photographers. I can’t now recall why I did so at this time, but probably Disfarmer was in some way in the air. It was a piece of work that elicited more interest than most – including an appreciative e-mail from Julia Scully making a minor correction to what I had written. At the time I wrote there was far less material available about the photographer and far fewer pictures on line. I’ve corrected a few typos, but otherwise here is what I published in May 2003. Mike Meyer‘s parents came to America from Germany some time before his birth in Illinois in 1884. When he was young the family moved to Stuttgart, Arkansas, now apparently widely known the “Duck and Rice Capital of the World” and home of the World’s Championship Duck Calling Contest. Stuttgart had been settled by German Lutheran farmers, many of whose descendants still farm the same lands. He was the sixth born of seven children, and the only unusual thing his relatives remember about him as a child was his musical ability. He had a fine ear for a tune and played several instruments including violin, piano and accordion. Meyer’s father died when he was around 14, around the time he went out to work. He continued to live with his mother and worked as a night watchman at the rice mill in Stuttgart. At some time fairly early in his working life he became interested in photography and bought himself a camera; and taught himself how to use it. We can only speculate what books or magazines on the subject he read – at this date or later. In 1914, his mother decided to move to Heber Springs because of its better climate, and he moved with her. There, he set up his first photography studio, in the open at the back of the house. Before long he was in partnership as a photographer with a studio in the main street. The climate was not kind to his mother, as a cyclone (probably the great cyclone of Monday, June 5, 1916, which killed 22 Cleburne County residents, although there was another disastrous one on Thanksgiving Day, 25 November 1927) destroyed the house. Meyer was apparently mentally scarred by its effects, although he soon recovered from any minor physical injuries – none of the Meyers are listed among the 1916 casualties. His mother moved out to live with one of her sisters, and he also left home. The Penrose & Meyer studio was on Main Street, in the same building as the Jackson Theatre, one of the earliest movie theatres in Heber Springs, built in 1912. Penrose was perhaps an existing local photographer, but nothing seems to be known about him. Unfortunately the block was destroyed in a fire in 1921, and he had to find new premises. The new studio Meyer built was some 20×30 ft, slightly above the typical size for daylight studios and its design was described as modern, perhaps because of its plain backgrounds. It had a wall with large windows fitted with blinds that could be used to control the north light Meyer favoured for his pictures. In the 1930’s it became a popular place to go and have your picture taken in Heber Springs, one of the few attractions in this small town. At some point after the cyclone, Meyer became convinced that the family in which he had grown up was not his own. He got the idea that there had been a cyclone at the time of his birth, and that during this he had been confused with the Meyer child. His own parents had been of a much higher class, more cultured and intelligent than the Meyers. Such delusions are perhaps not as uncommon as we might think, and pass idly through the minds of many, perhaps especially those whose behaviour suggests mild autism, as some of the descriptions of Meyer might suggest. Meyer took his thoughts further to the point of an obsession, more or less breaking off relations with his real family and changing his name. Meyer was convinced he was not truly of German stock and was not from a family of farmers. He invented a new name for himself to express this: Disfarmer. Heber Springs was a small town of around 2000 people, although many of the studio clients will have been from the surrounding country of Cleburne County, Arkansas. The town is at the foot hills of the Ozark Mountains, and virtually the only industries at the time were farming and logging. Cotton was the main crop in the southern part of the county, and throughout the area many farmers were living at subsistence level. Julia Scully (see below) was able to interview Mike Disfarmer’s assistant, Bessie Utley, who worked for him when the studio was popular in the 1930s and 40s. She not only developed his plates but also often cooked for him. Despite his oddities – or perhaps they increased the attraction – a trip to the photographer’s became one of the attractions on the trips people made into the town. There they stood in front of the plain dark background in the studio while the photographer carefully adjusted the blinds and got the lighting just how he wanted it. The town’s funeral director recalled a sitting with Disfarmer, and suggested that it sometimes took him an hour to arrange the lighting. Although he may have worked slowly and thoroughly, it seems unlikely that his clients would have had so long a time to wait. However, it is clear that the photographer took his work very seriously and the results he obtained show this. Over the years, Disfarmer must have taken many thousands of pictures. As well as the studio work with which we are familiar there were probably pictures taken in peoples homes and elsewhere. Images by Disfarmer must be present in many family albums covering a wider range of his work and it would be of interest to discover if these show the same characteristics as the published work. Disfarmer was said to have used a large home-made studio camera. Like many photographers of the time, he stuck with glass plates rather than changing over to film, at least until around 1945. Joe Albright also suggested that the camera back went through a hole in the back wall of the studio, presumably into a dark area, and that Disfarmer looked at his subjects through a window when setting up the images. Having the camera back in the darkroom area of the studio would give the advantage of a very clear image on the ground glass screen. If the window through which the photographer viewed his subjects was equipped with a lightproof blind, plates could be loaded or unloaded without a darkslide. However, memories of Disfarmer and the way that he had worked were dim, since over 20 years had passed before the interviews. Disfarmer, particularly as he grew older, had had less and less contact with other people apart from taking their photographs, but retained his interest in music. The town barber, John Hendricks, an amateur guitarist, remembered evenings when he and Disfarmer sat in the studio playing together, Disfarmer was still a good fiddle player and enjoyed playing the kind of country music popular in the South. Perhaps because the war had come to an end, but also possibly because of the photographer’s increasingly offhand and eccentric manner, business dropped off. Disfarmer’s studio remained open until he died at the age of 75 in 1959, but we know nothing of his work in these later years. Disfarmer became more and more a recluse, avoided by most of the townspeople and he had few visitors, and even fewer customers at the studio. He was there on his own when he died in 1959, and it was two days before his body was discovered. After Disfarmer’s death, the executors wanted the studio cleared, and Joe Albright, a retired army engineer with an interest in photography, was living in Heber Springs and bought the entire contents of his studio for the token amount of 5 dollars. Although Albright was disappointed to find no photographic equipment worth saving, he did have the foresight to hang on to the boxes of glass negatives that he found, some 3,000 of them, thinking they might be of some interest to local historians. The latest of these negatives appears to date from around 1945, possibly suggesting that at this date Disfarmer changed over to using film. Albright kept the negatives in store until around 1974. It was then that photographer Peter Miller and his wife Karen moved from New York to join an Arkansas cooperative corporation ‘The Group, Inc’, and found themselves running the weekly Heber Springs newspaper ‘The Arkansas Sun’. They began featuring old photographs supplied by their readers, and Albright got in touch, offering some of Disfarmer’s work. ‘Modern Photography’, edited by Scully since she joined in 1966, was a mass circulation photographic magazine that unusually attempted to take the medium seriously, publishing features by critics including Andy Grundberg as well as a regular column ‘Seeing Pictures’ written by Scully herself. Many photographers both in the USA and abroad looked to it for a wider view of creative developments, until it was finally swallowed up by its rival ‘Popular Photography’. The texts published by Scully form the basis for all other articles on Disfarmer, including this feature. Disfarmer’s work began to be published in magazines and a book appeared in 1976, published by Addison House: ‘Disfarmer: The Heber Springs Portraits, 1939-1946‘ with Disfarmer Photographs printed by Peter Miller and text by Julia Scully. Other publications followed, including a feature by Scully in ‘Aperture‘, certainly one of the highest accolades a photographer can achieve. In issue 78 (Fall 1977) the company was august, including Paul Strand‘s images from his garden at Orgeval, Hilla and Bernd Becher‘s images of preparation plants (“breakers”), colour by Joel Meyorowitz and early pictures by Francis Frith and others from Egypt. From an unknown and forgotten career in a small town in rural America, Disfarmer had enjoyed a meteoric rise over a couple of years to become regarded by many as a major figure in the photographic pantheon, drawing comparisons to Atget, Arbus and Sander. Disfarmer is said not to have posed his ‘sitters’, and indeed most of them simply stand facing the camera in simple groups. However it is a rare individual who does not look unflinchingly into the eye of the camera, and even rarer one who smiles at at. Whatever he did or did not say to them, Disfarmer clearly imposed a relatively common approach in these matters. The strength of these images is in part in their simplicity, but their appeal is also very much to do with the character of the people that he photographed. The pictures have a built-in nostalgia, a reference to a time past that for most of us was never present, except in film. The people here are a past we would perhaps like to think we had, a view of America when the dream was still real, even if those who are shown were not getting much of a share of it. These are hard-working people, some still in their working clothes, but mainly in their ‘Sunday best’, reserved for going to church or for having your picture taken. Honesty apparently shines through their faces, looking at us from a simpler world where right was right. There is also a fine humanity in them, often most evident in the small imperfections. Disfarmer used soft, overall lighting, probably using reflectors as well as the large north-facing windows which even reduced or eliminated any shadows on the underside of hat brims. Generally the light was slightly directional, coming from the left of camera to produce some slight form shadow which gives the figures their three dimensional quality. His exposures seem to have been quite lengthy – perhaps in seconds – with some faces clearly showing movement blur. The people are clearly concentrating on having their picture taken, staring into the camera with the same kind of intensity that was required for the daguerreotype. I get the feeling that Disfarmer regarded himself more as a scientist than an artist, pinning these people closely against his background and walls almost as if he were making a butterfly collection. But here the subjects respond to his game, some with dour obedience (life was hard and many things just had to be born), some with near terror and others determined to show their individuality through pose or gesture. For many a trip to the photographers was perhaps similar to a trip to the dentists, something that had to be endured. Young men about to go to war, dragged in by their family to pose with them, and also proud men returning and celebrating. Although some families will have had their Kodaks, there was still an immense gulf between the kind of small blurred mementos these provided and the carefully composed large format quality of the professional. Although I have no doubt that these are fine portraits of their time, to me the work lacks the complexity of that of Atget and Sander. It is, like its subjects, honest and straightforward. Evans took his pictures as an East coast intellectual coming in to the lives of the share-croppers; while Disfarmer, despite his own certainty that he was an outsider, had known and shared the circumstances of those who entered his studio for all of his life. It is work from a different viewpoint, equally valid but more limited. Evans – and his colleagues at the FSA – give us a view from the outside, and at times one that was designed to further the aims of the organisation, although Evans himself clearly worked to his own agenda. In later years, the work of the photographers was more clearly linked to the war effort. Disfarmer had no such pressures, providing a service directly to those he photographed, if one suspects rather on a take it or leave it basis. I admire Disfarmer’s work, and was pleased to have the opportunity to view some original prints at a recent exhibition. These were prints made from the original negatives, rather than prints made by the photographer himself, and it would be interesting to be able to compare the two. Those who have edited and published his work appear to have treated it with commendable respect, although it is not possible to know how clearly their selection of his images would reflect what Disfarmer would have considered to be his most important work. Disfarmer isn’t a photographer whose work has changed the course of photography, but work that was carried out by someone who remained unknown outside his own small community. It is interesting to speculate on other Disfarmers hidden away in their own small towns around the world, working quietly and diligently cultivating their own gardens. There have indeed been such claims made for other photographers – including even some from Arkansas – but the evidence that I’ve seen usually fails to support their cases. However, interesting photographers from the past are still being discovered. It is perhaps less likely in the present that such talent should be overlooked. Had he lived in the present, Disfarmer would probably have been spending a great deal of time on the Internet, creating a web site about his switch at birth and his photographs. Bushels are rarer these days and fewer candles remain hidden. Of course not all photographers get treated fairly after their death. To judge from John Berger’s review of ‘A Village in France’, Louis Clergeau‘s pictures of life in a small town near Blois in central France from 1902-36, his work has been reduced to an almost meaningless nostalgia. Photographer Toba Pato Tucker was so impressed when she saw Disfarmer’s work that she went to Heber Springs for two years, photographing some of the same people that he had photographed, as well as their descendants and relatives. The differences her work showed between the 1940s and the later work was the subject of a book by her and Alan Trachtenberg, published by the University of Mexico Press in 1996. There are a few things in the piece that we now know more about as a result of further research – and perhaps a few more will arise from the latest publication by Kim O Davis. If I owned a suitable e-reader I might well buy it, but I still prefer to read on paper rather than on screen. But I’m rather more likely to buy a book of Disfarmer’s images. Photographing the protest at Downing St, Uphold LGBT Rights at Sochi, it was easy to concentrate on the more exotic elements of the scene, but it worried me slightly, and in particular I pondered over whether to use the above image with some of those in more unusual dress as the lead image to the story. Of course the great majority of those at the protest were more normally dressed, though many had followed the ‘wear red’ dress code advised for the protest. And probably if they were holding up a placard or doing anything to distinguish themselves visually, if I noticed them I will have photographed them, and there is a chance their picture will have made the edit. But in the end I chose it because it seemed to neatly present the event. 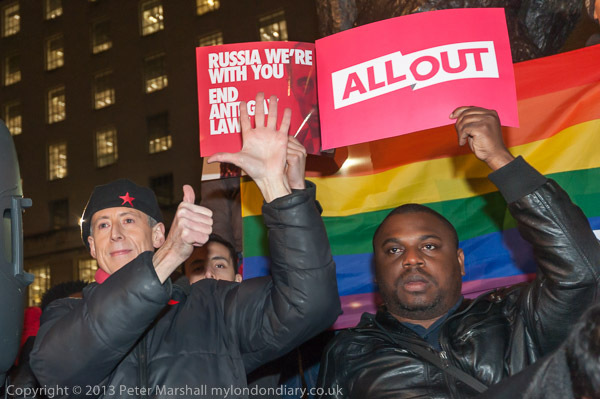 At bottom left the name of the group ‘All Out’ that had organised the event, the guy in the Russian military hat with pink fluffy wings holding up a poster ‘Global LGBT Equality Now!’ A man in a white bikini and fur coat and another holding up an uncompromising anti-Putin placard in his red gloved hand. It has all the elements, though technically it isn’t one of my best flash images. And in some respects I think I had put things together a little better three frames previously, with the image below. The key factor in my preferring the upper image for the purpose was simply the legibility of the ‘All Out’ and Putin placards. 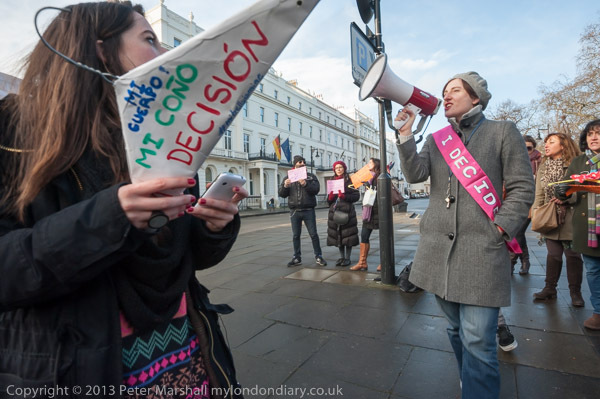 Or perhaps I should have chosen something a little more serious looking, such as Peter Tatchell demonstrating the 6 finger salute – it was a protest involving Principle 6, the Olympic non-discrimination principle. He might well have preferred me to use a picture showing a mass of protesters rather than concentrating on him, and I try not to be too concerned with the ‘celebrities’, although I know that such pictures are more likely to get printed. Perhaps an image like this one, where he is more in the background. It worries me a little with the text in Russian on the t-shirt of the closest figure, Of course there is a good reason why, but it’s still something of a barrier to non-Russophones (or should that be Russolexes?) and I kick myself slightly for not seeing I’d obscured the ‘H’ of Homophobe. I’ve obviously done some post-processing to even out the illumination across the image, but as almost always with the pictures I put on the web it could have been done a little better. That head at the bottom of the frame just right of centre for example is too bright. 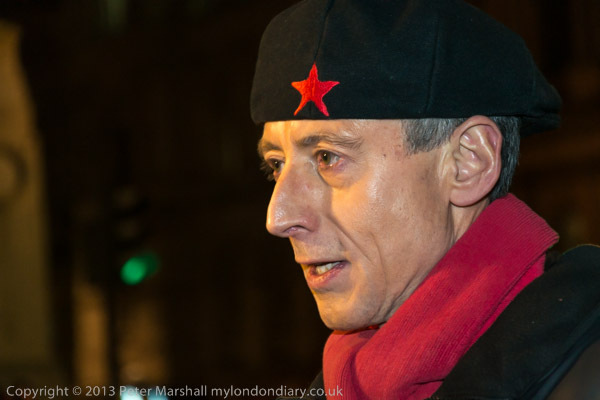 And looking at the image now I’m surprised I didn’t make the red star on Peter Tatchell’s cap more visible. It shows up much better in this image, taken while he was being interviewed. There are three images from a similar viewpoint on the web page in Uphold LGBT Rights at Sochi and the first was without flash, using just the video light on the camera he is looking into. Here I’ve perhaps slightly overdone the flash or could have brought it down a little in post-processing, and perhaps the red star should be a little less bright. I rather like the green circle of a traffic light, but others might not. 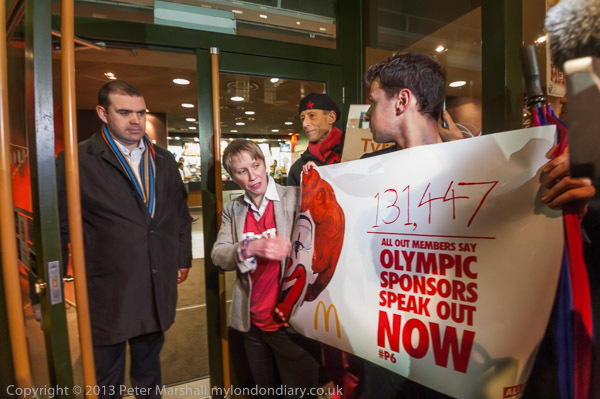 Flash that had been working well earlier in the event rather let me down when I was trying to photograph the handover of the banner with the number of petition signatures on it to the UK Head of Communications for McDonalds, but the real problem was that there was a totally rigid block of photographers around the doorway, wedged shoulder to shoulder. I’d got there a few minutes before while there was still time to get a place, but couldn’t move. At the right you can see the edge of the picture is obscured by part of a TV camera. This was taken at 16mm, and after this people began edging in and I could no longer photograph the whole scene. 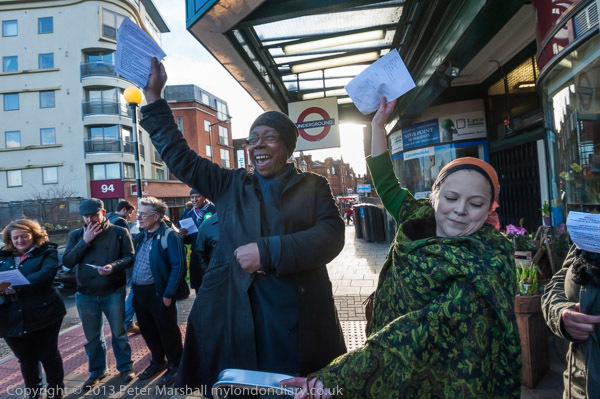 I have to admit to being almost entirely ignorant about wassailing before I went to Willesden for their ‘urban wassail’. Of course I’d heard and even sung the odd wassail carol, but though we sang the song we never drank the drink, and it seemed to be something that came from an older and more bucolic (and alcoholic) past. Rather like the traditional English breakfast which was ale. Bacon for most was a rare treat. In my parental home, Christmas drinking was in any case restricted to non-alcholic ginger cordial, my mother being a firm supporter of the temperance movement and my father who I think had enjoyed the occasional pint of beer in his youth knowing what was good for him. Temperance was of course a misnomer; as a small child I would be taken to regular meetings of the National British Women’s Total Abstinence Union (NBWTAU), and well before I could write or come to my own decisions on the subject my infant hand was guided to a shaky signature pledging to abstain from the demon drink as a ‘Little White Ribboner’. Traces of the old tradition still persist, with ‘mulled wine’ being offered at some of our family Christmas get-togethers, though its a drink I avoid. It seems to show a lack of respect for the oenologist’s labour and skill to water down the stuff down, add chunks of apple and cloves and other spices and boil the mix up, doubtless removing much of the alcohol, certainly a fate that should be reserved only for the cheap and undrinkable mass produced products. But wassailing was also another excuse for a party in cider country, with the blessing of trees in the orchards on Twelth Night (and later ‘Old Twelth Night – January 17th.) I don’t think it was ever done in Middlesex, and certainly not in my grandfather’s orchard in Feltham where he was a market gardener, nor for that matter in the nearby orchards of Heathrow. It was apparently revived in the West Country by the Taunton Cider Company in the 1930s. Perhaps I might have got some cider later had I stayed around in Willesden, but all that seemed to be on offer at the art gallery where the event on the street finished seemed to be soup or fruit juice. The soup looked fine, but I looked at my watch and found it was an hour later than I thought – and I had a longish journey home to where my dinner and a bottle of a quite drinkable French red was waiting for me, and rushed away. The point of the event was to promote local community and a vital part of that is the small local businesses that contribute to the character of the area. 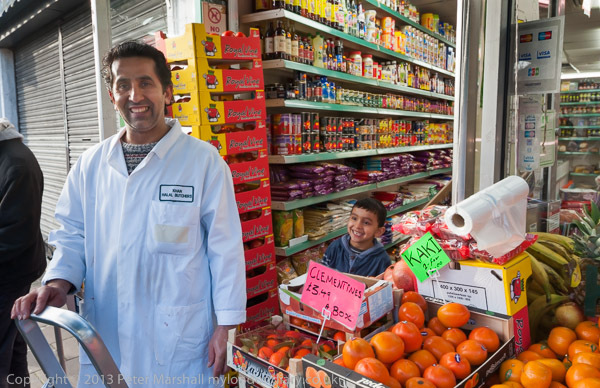 Willesden Green is fortunate to have so far evaded the worst of the invasion by chains and franchises that have made so many of our high streets bland, though how long it can continue to do so as gentrification advances into every remaining area of London is doubtful. 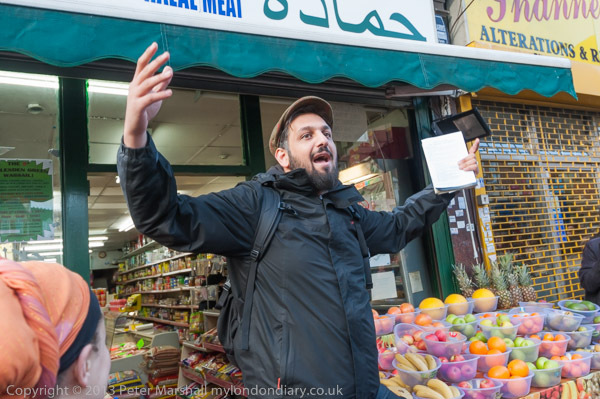 It was a also an event which brought poets on to the street and performing, as well as a community choir, a multi-faith choir and other performers, and it ended at the site of Willesden Green Library, long an important centre for the many communities in Brent, though currently a building site. Brent has one of the most diverse populations in London, and in the past the borough has financed many festivals and projects. Photographically I had few problems and it was a fine opportunity to take pictures. The low winter sun did occasionally make life difficult, particularly at the first shop where we paused, Daisychain Florist. I would have liked to be able to move to put the sun behind the Underground sign, but couldn’t do so. With the pictures that show shop interiors as well as people outside, there were also problems of colour temperature difference in the lighting. Fortunately these are perhaps less pronounced with digital (I think some films exaggerated them) and it’s also possible to apply a change in colour temperature to selected areas with Lightroom’s Adjustment brush. But it really was just a very nice event, and in very good weather for the time of year. 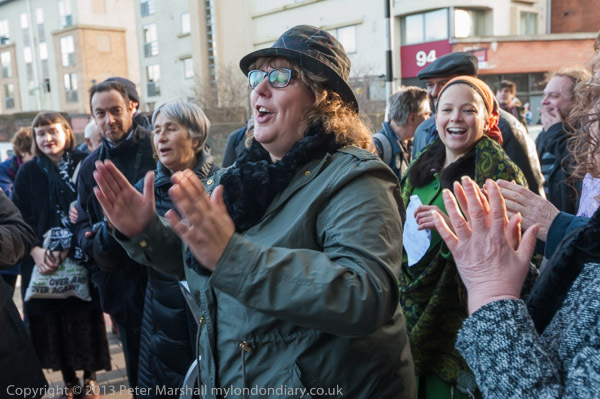 I missed the previous year’s Willesden Wassail, which might have produced some interesting images, but would have been rather less comfortable, with snow on the ground. 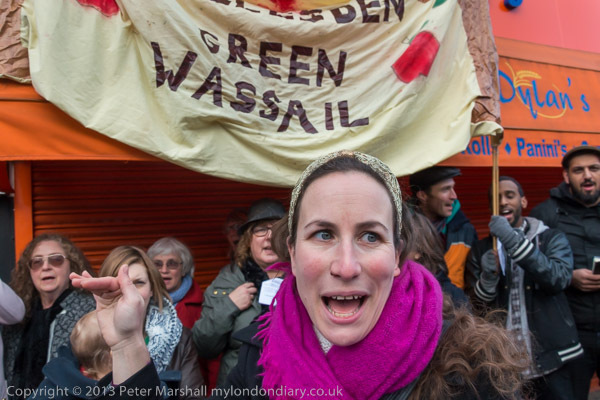 You can see many more images and an account of the event at Willesden Wassail. The line from Richmond to Willesden Junction goes over the canal on the bridge at the right. Trains are my favourite form of travel – if I have to travel. Though I don’t always feel good about them when I need to join the rush hour crush to or from London, especially when SouthWest Trains put on a 4-car unit in place of the normal 8 carriages, as happened at times during the flooding. They’ve also developed a habit of doing the same trick (doubtless simply to save their costs) on some Sunday services which leave many standing, though not quite at the sardine level of rush hours. But given that the trains are running reasonably to time and have sufficient room, trains are a civilised way to travel. Generally comfortable, seats with enough width and legroom at least for a person of my reasonably average size and smooth and fairly quiet (one of the few ways the railways have improved since my youth, though if they still had windows you could open and stick your head out you would no longer get soot in your eyes.) You can sit and read a book, or look out of the window at the changing scene. One of my favourite journeys for looking out of the window always used to be the line around the north of London, which used to run from Richmond to Broad St, right into the City of London. Though in the old days you did need to clean the outside of your window before boarding if you wanted to see out. The journey perhaps got even more interesting when the service changed to run to North Woolwich via Stratford after the closure of Broad St in the 1980s, though I missed the section between Dalston Junction and the City. The line is still fascinating, though with the new Overground trains you sit with your backs to the window and get a crick in your neck trying to look out. But the transfer to TfL has certainly resulted in a better service on the line. 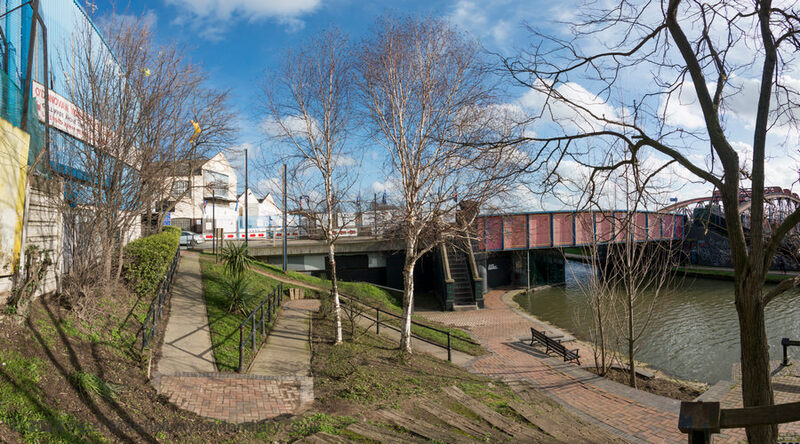 For much of its route it gives an elevated view of the northern suburbs of London, reaching parts that might otherwise remain unknown except to their residents. 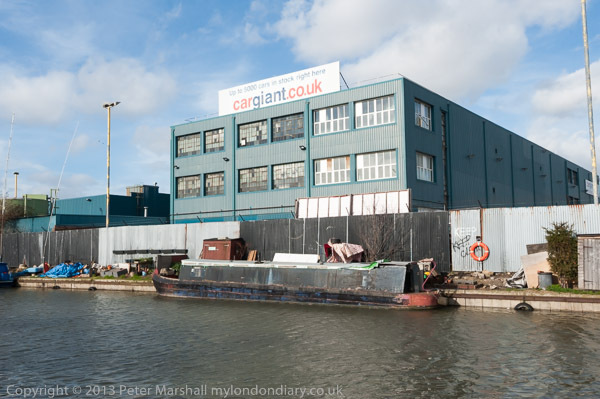 I’m one of many photographers of London have used it as a basis for projects, either formally or informally in past years, and Mike Seaborne‘s series very loosely linked to it is one example. 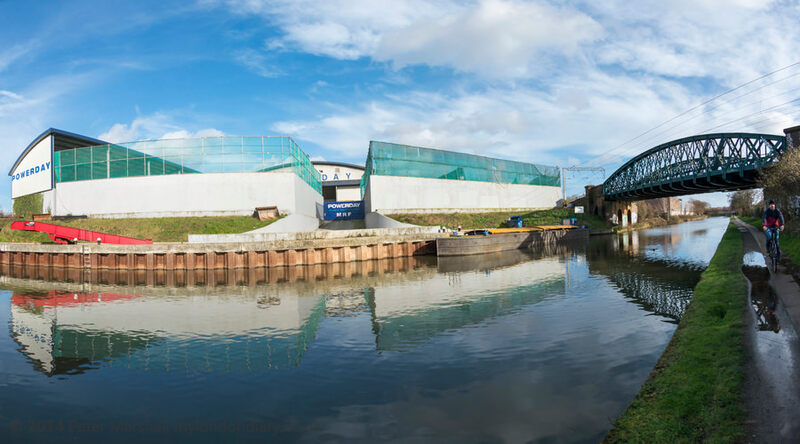 One particular area on the line where I usually put down my book and look out is just before Willesden Junction, where the line crosses the Grand Union Canal before going through an industrial area and reaching the station. (Like Clapham Junction which isn’t in Clapham, Willesden Junction isn’t in Willesden – railway companies appear to have delighted in confusing travellers from their early days.) Many years ago I took many pictures around this area, but since then it has changed quite a bit, and every time my train has gone through I’ve thought it would be good to get off and take another look, but have never had the time to do so, always on my way to other places and events. But on a Sunday morning at the start of February it was a nice day, and I’d decided to go to an event in Willesden. 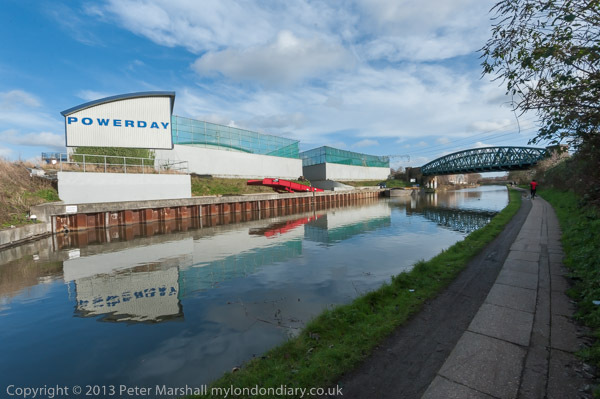 Normally I’d have got off two stations down the line past Willesden Junction – though only a couple of miles away, but I decided to pack some sandwiches and go a couple of hours earlier so I could get off and take some photographs. Afterwards I could take a bus to where the event was starting. I was a little worried at the weather as I walked to the station – there was a clear blue sky with not even the usual Heathrow vapour trails, something of a killer for the panoramic images that I intended to make. But my luck was in, and after the journey (it took a little longer than usual thanks to engineering works and a bus replacement service) there were some interesting clouds. There is a well-hidden but well-used footpath that follows the side of the Willesden Junction to Clapham Junction line as it goes over the many tracks of the main line to Euston, before descending into the industrial estate. It used to overlook a huge metal reclamation site, but this seems to have been very much cleared up now. I sat on a bench to eat my sandwiches in the sun (it was surprisingly mild for London in February) in a small memorial park to Mary Seacole, a remarkable Jamaican woman who used the profits from her general store and boarding house in Jamaica to nurse wounded British soldiers in the Crimean war, as well as medical work in Jamaica, Cuba and Panama. The memorial park was created around the time of the bicentenary of her birth a few years ago here, close to where she was buried in St Mary’s Catholic cemetery in 1881. She has become a controversial figure in the debates over the construction and teaching of British history, with many feeling she was largely sidelined because she was black. I crossed the canal and walked west along the towpath. Once past the Mary Seacole Garden and Mitre Junction it isn’t the most exciting of walks now. I was annoyed coming down onto the towpath to find a fence on top of the wall which I had photographed over years ago now making this impossible, at least without some way to raise my camera higher than I could reach up. 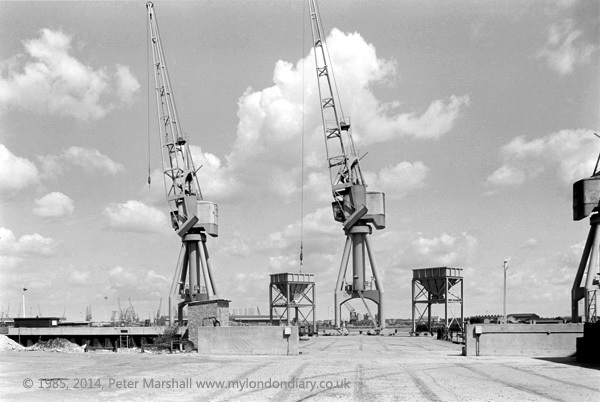 And further on, what had once been a busy railway site at Old Oak Common now just had a few new distant sheds. 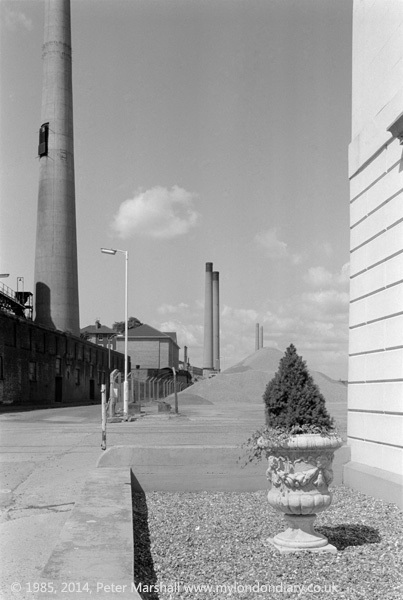 The top picture on this post was also something of a disappointment – and it works better on the less wide 16mm rectilinear view above, taken from a more distant viewpoint. But my disappointment was that there was a much better view from the train, a little before it reaches the bridge. The extra height makes a great difference, and there was a fence in the way so I couldn’t climb to get closer to the railway view. All pictures were taken with either a Nikon D700 with 16-35mm lens or a Nikon D800E with 16mm fisheye. The latter images were converted using PtGUI to equirectangular projection. 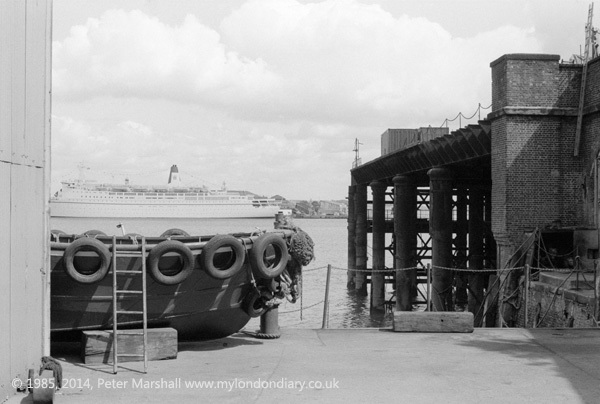 West St, Gravesend, August 1985. J&R Starbuck, a family business was founded by William Starbuck soon after 1634. In 1985 I was teaching full-time, and when the Summer Term ended in mid-July we went to Germany for a couple of weeks with our friends in Neümunster where I finished the photography for a project I had begun a few years earlier, German Indications, a series of images and texts which was shown the following year and which in a slightly different form is now online. I hope to publish am extended version of this as a PDF, but am having problems finding some of the colour transparencies. So more about this when I find them or decide to abandon the quest. 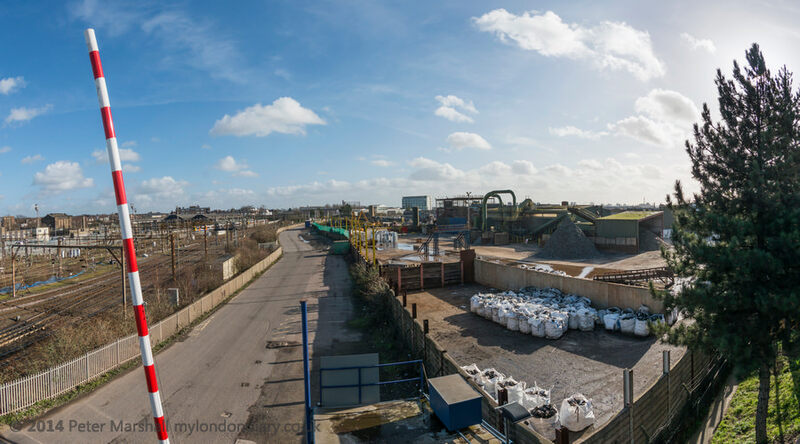 I went back a few years ago and found little that was still recognisable from my previous visits, with most of the industry replaced by flats and supermarkets or warehouses or simply now derelict land, with all buildings razed. one has a different top floor. The rest has all gone. 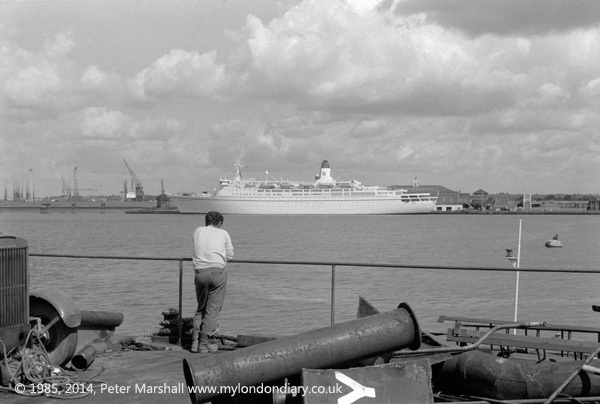 Gravesend locals will probably recognise more than I do. I didn’t make many notes at the time, but can trace much of my wandering from the contact sheets. I walked along West St and Clifton Marine Parade towards The Shore, though wandering a little from the direct route. The pictures on this page are in the order that I took them, although I may well have wandered back and forth a little. Some of the pictures were taken on Kodak Technical Pan, a fine film in several ways – fine sharpness, fine grain – but a real pain to process for pictorial use. Kodak made it for things like microfilm records where high contrast was needed. I found it very difficult to avoid uneven development (at least until Kodak’s Technidol became readily available here) and you can see that in the sky in the image above. Unlike most negative defects it isn’t easy to correct digitally either, though I don’t think I’ve yet tried on the above image, though I’ve tried with some success on others here. And as you can see, I had this image laterally reversed when I put the watermark on it. It’s rather too easy to do this when you are scanning images. This site was still easily recognisable, although the whole area is looking far more run-down. As of course you can easily see on your computer, using Google Streetview, which shows you how the same corner looked in May 2012. This walk will be continued in another post. I grew up with The Pilgrim’s Progress, introduced to it before I could read, not the actual book but a rather tedious card game bases on Bunyan’s book. And in the book, one of Bunyan’s excessively characterless characters tells Pilgrim how the king’s labourers have tried for 1600 years to make the slough a better and firmer place, tipping at least 20,000 carloads if not millions of materials from all over the kingdom into it to try and render the ground firm without success. Slough has always seemed to be trying to emulate this description, most recently with a large redevelopment area called Heart of Slough, and it’s a place I find acutely depressing to visit at the best of times, though it perhaps gets better if you know it. Or perhaps not. There are some interesting places to visit not far away, and I sometimes struggle through it on my way to Burnham Beeches or Stoke Poges. 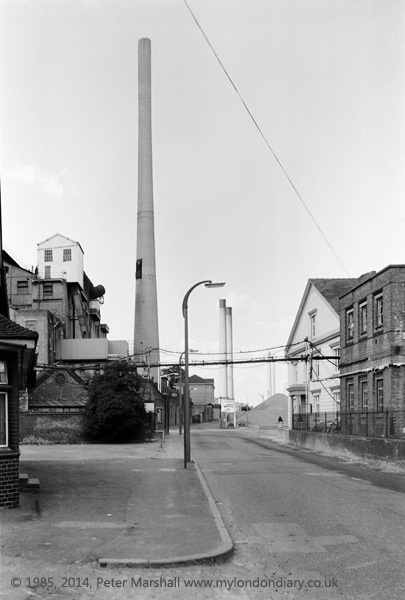 But there are some good points to Slough; for years until I was diagnosed with diabetes I was often kept alive by the sugar surge of a Mars bar on lengthy photographic outings. 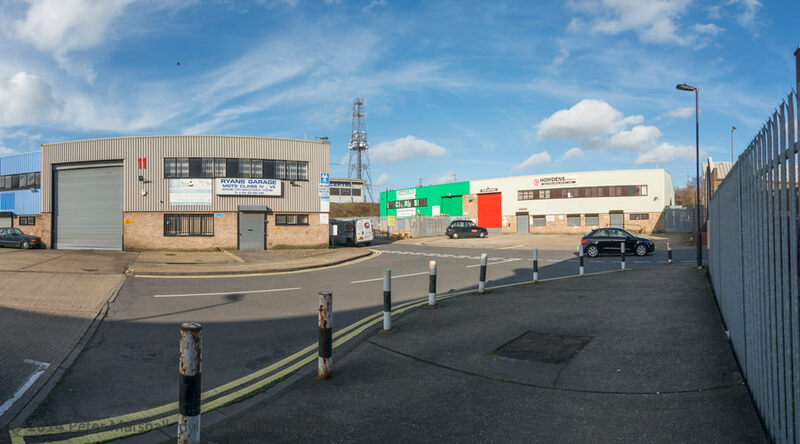 Mars were one of the first major companies to set up on the Slough Trading Estate, one of the first business parks in the UK, a few years after it was founded in 1925. (I did once spend several days photographing what is still the largest business park in single private ownership in Europe.) It’s perhaps a point in Slough’s favour, though it may well have contributed to my condition. 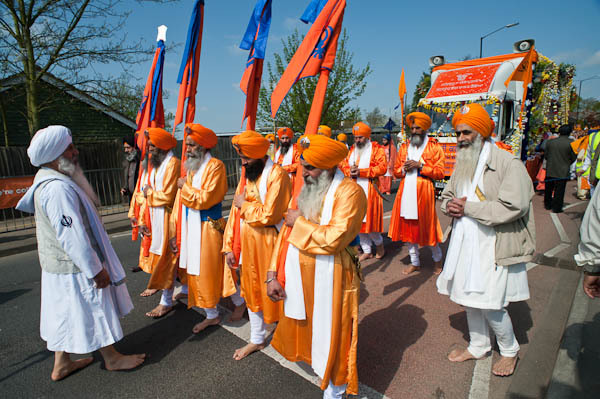 But the best thing about Slough is perhaps its ethnic diversity, and the best time to go there is for Vaisakhi. But that would not have been a popular sentiment for the rather disgruntled and disappointed group who were gathering at Slough station when I arrived there on February 1st. I can understand many of the frustrations and lack of power that drive people to support groups like the EDL, but am appalled by their gullibility in believing the lies of the media and disappointed by they failure to lay the blame in the correct place. As the old slogan goes: “Unemployment and inflation are not caused by immigration” though perhaps now we should replace inflation by financial collapse, though it wouldn’t scan. The enemies of the workers are not immigrants, but bankers and the other greedy rich, and while the Labour Party has moved away from its traditional working class base, the left has failed to attract support (not least because it is so dominated by the middle class and mired in irrelevant factional squabbles.) Leaving empty ground for the EDL and other simplistic right wing drivellers including the saloon bar rhetoric of UKIP and the nuttier reaches of the Tory party. 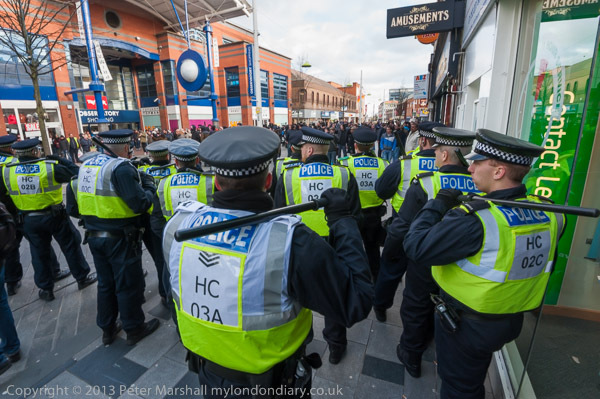 I tried hard to be fair to the EDL, and to report accurately why they were protesting and what they actually did and said on the day (though I wasn’t able to stay and report on all the speeches as the police were still beating back the counter-protesters.) There are a small minority who are sincere in the belief that the EDL is not Islamophobic but is only opposed to the actions of a few Muslim extremists (and I pointed out to them that the great majority of Muslims are also opposed to these extremists), but they seem to be greatly outnumbered by those whose chanting clearly displays a more general and widespread hate of all Muslims. 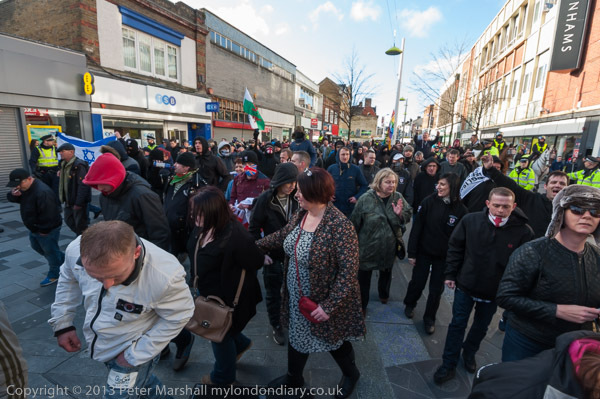 Slough was clearly something of a disaster for the EDL whose numbers were low – considerably lower than expected. Their ‘We go where we like’ turned out to mean ‘so long as several hundred police with riot shields and horses clear the path for us.’ The antifa and local youths would certainly have been more than a match for them had the police not stepped in on the EDL side. 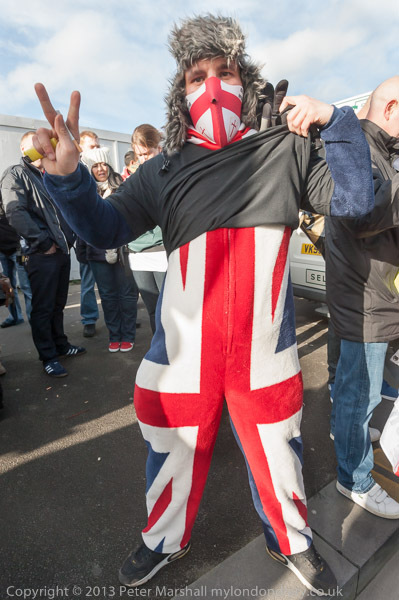 While the EDL were clearly losers, I’m not sure there were any real winners on the day. The police didn’t manage to prevent public disorder – in fact they contributed greatly to it. I felt the decision to force a way through was wrong, amounting to the police taking sides, and creating more public disorder by doing so. 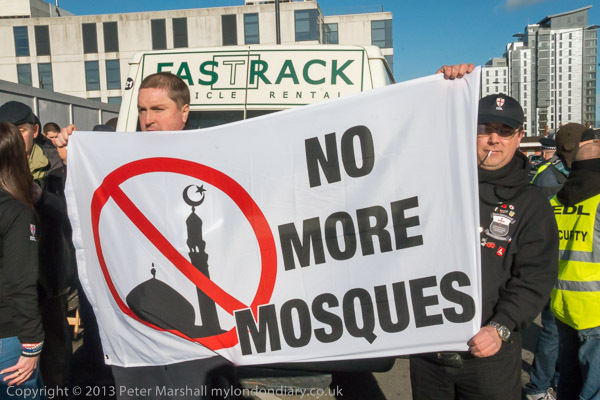 They should perhaps have accepted the impass and kept the two sides apart while telling the EDL to hold their rally where they were stopped before returning to the station. 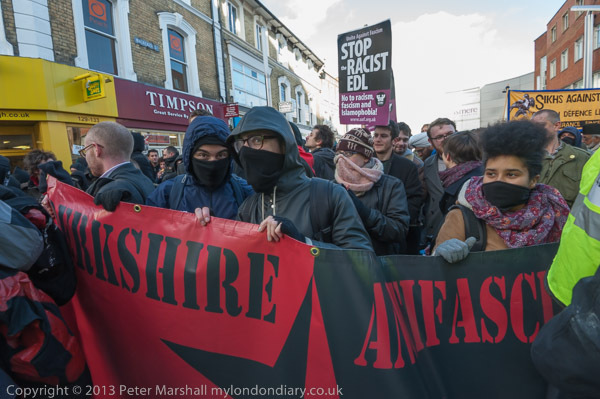 The antifa claimed a victory but didn’t manage to prevent the EDL from holding a rally – though their actions did mean (with the help of the police) they were denied a platform with the speeches being made to an otherwise empty town centre with only a few police and journalists close enough to hear what was being said – if they had been listening. Many shops lost trade, with most of the High Street closed off most of the afternoon, and doubtless many Slough shoppers were inconvenienced by the closure and by some bus diversions. Some were visibly scared by what was happening, particularly those unfortunate enough to be near the out of control police horses. And this photographer was bruised by a plastic bottle thrown by one of the Slough youths, threatened and abused by some of the EDL, and hit on the ankle when a group of EDL threw down a barrier and tried to rush out of the rally pen. I’m still limping a little two weeks later, though I think nothing is broken. Many of us also got pushed around by the police rather roughly. 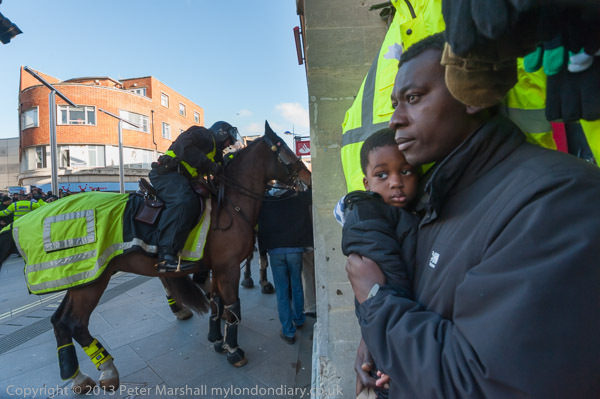 EDL Saved by Police in Slough. Of course William Randolph Hearst never actually sent the famous telegram “You furnish the pictures, I’ll provide the war!”, but it represents the attitude of those who run the media so well, that there is truth in it although it never happened. The bias isn’t always or just political, but also one that favours the sensational. And of course one that deifies ‘celebrity’, even if most of the celebrities are people I’ve never heard of, nor want to. I’ve often come home from events I’ve photographed or been a part of and read the stories in the newspapers or watched the few seconds of TV coverage, and have seldom found the reports in the ‘mainstream’ media particularly accurate or convincing. Often it isn’t the journalists fault, and they are simply not given the time or space to cover things adequately, but there are clearly some things that a matter of deliberate distortion, as well as sometimes a complete failure to understand the issues. The proliferation of social media and the stories that people post on Facebook and in blogs etc, and perhaps particularly images have almost certainly lowered the standards of accuracy, particularly for the large media organisations who pick up the more trending of these stories and run with them, often apparently without applying the checks of traditional reporting. But just as anyone can now tell lies to the world, anyone can also pick up on the obvious deceptions and post about them. Of course there are protests in the real Venezuela, and some of the comments reflect this, though seldom in a way that would aid understanding of what is really happening there. Nor can you rely on the international media – or for that matter on the statements of the Venezuelan government or supporters such as the Venezuela Solidarity Campaign. If you really want to know what is happening you need to look at a wide range of different sources and to recognise the point of view embodied in each of them. Don’t trust the media; view them all critically. 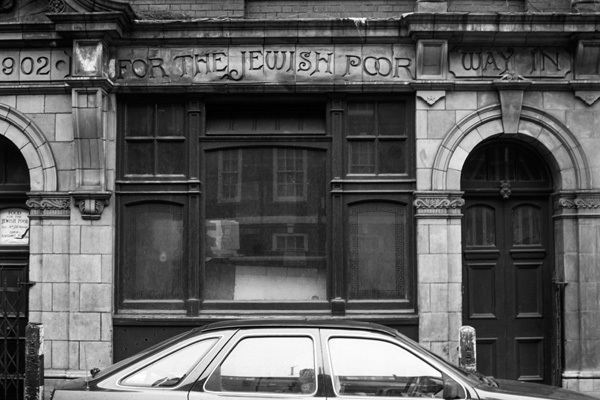 I came across the Jewish Soup Kitchen in Brune St, Spitalfields in 1986, but I never went inside. I thought it had probably closed down, but apparently it kept running until 1992, but I was never there when it was open on a Tuesday morning. 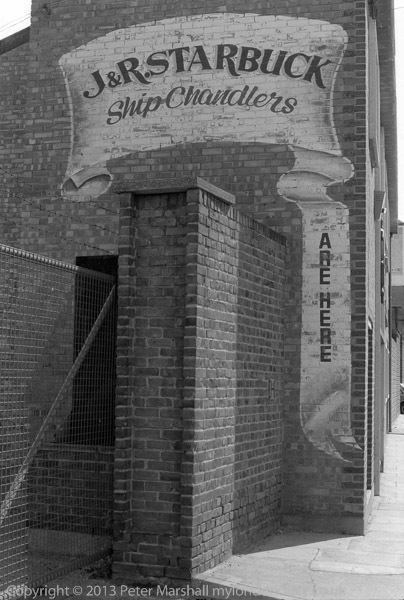 I was just starting to photograph London in a more serious and systematic manner, and one of the first areas I chose to work was Spitalfields, an area of London that had been part of the Jewish East End, but which had for some years been rapidly losing most of its Jewish population to the northern and eastern suburbs. 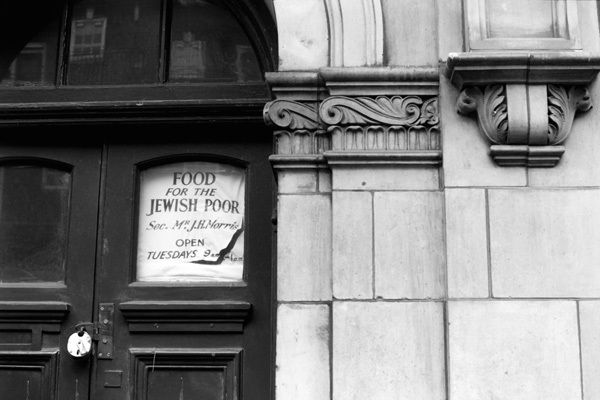 By 1992 there would have been few Jews remaining there in need of handouts. Though perhaps the Archbishop didn’t put it strongly enough. It is more than a disgrace, particularly as it is the result of a deliberate and considered policy. The clergy at least should recognise evil when they come across it. You are currently browsing the Re-photo blog archives for February, 2014.